More than 4 000 people participated in a colorful celebration to create awareness for people with disabilities in Hawassa, Ethiopia. The topic this year was: Inclusion matters, access and empowerment for people of all. -IAS Ethiopia took the bigger role in the celebration using banners, brochures and t-shirts to create awareness to all stake holders. Dramas were performed by students with disabilities to advocate for their rights, says Eshetu Tilahun, Project leader IAS Ethiopia who also was part of the celebration. Two students, one visually impaired (using Braille) and one intellectual impaired students inspired the attendants by presenting two big lessons using poem and reading from an article. -The focus of their message was showing the participants how people with disabilities are effective and able if they get the chance to education. Another child, integrated to the regular class from IAS center, grade two, read one article to show how he improved his studies since he joined the project, says Eshetu. -We had a great day, altogether over 700 people were gathered, says Irene Shayo, Programme Manager, IAS Tanzania. In Tanzania the event was organized by IAS Tanzania together with Free Pentecostal Church of Tanzania, Information Center on Disability and the authorities from the local government of Rukwa Region. -The main reason for this day was to highlight the rights of persons with disabilities. We had children with impairments such as albinism from different schools that performed with for example poems. People were sad when they heard the stories about people being mistreated. But at the same time they were happy, since they saw that people with disabilities are capable, says Irene. A speech was held by acting District Administrative Secretary, Oresta B Haule. He addressed the community on the rights of persons with disability and encouraged the whole district to have a budget for persons with disability. -The celebration was important since it was a part of awareness creation. It was also a platform for persons with disabilities to raise their voices. Children performed to create awareness for people with disabilities in Mawenzusi, Tanzania. Oresta B Haule,Acting District Administrative Secretary in Tanzania addressed the community on the rights of persons with disabilities. Gabriel Geoge, Children Council Leader in Rukwa Region, Tanzania, read a message on making environment accessible. Mohamed Deqe from Ethiopia was born with a physical disability and because of this he was denied to go to school. But thanks to IAS project in Inclusive Education (IE) he can now read, write and count and is one of the top students in school. All children should have the right to go to school. Still, as many as 126 million young people today can´t read or write and disabled children are particularly vulnerable as they are often not accepted by friends, family or the communities in which they live. It is not uncommon that these children are being hidden in the home and denied the opportunity to go to school. Therefore IAS work actively with projects in Somalia, Ethiopia, Tanzania, Sudan, South Sudan and Kenya to help these children get a chance to education. “I spoke with Mohamed, 15 years old, who lives in Jijiga in the Somali region of Ethiopia. He is truly an example of that Inclusive Education works. Mohamed was born with a physical disability and can only walk on one leg, with a crutch. Because of that, he was denied the opportunity to go to school. After a year of schooling at the IAS Special Needs Education Center, he could both read, write and count! He even helped his teachers to teach the other children. His best friend had difficulties to manage in school but when he received extra help from Mohamed he was able to continue his education. -Provide support to parents who have children with intellectual disabilities. -Arrange investigations on why children may have learning difficulties. -Influence the development of educational materials and curricula. -Construction of additional classrooms for children with learning difficulties to have a quiet environment to learn better and get a customized education. -Promote a continuous dialogue with local education authorities to have “Education for All” on the agenda. How is Inclusive Education defined? And how should it be implemented? These were some of the questions that were discussed when IAS arranged a seminar on the topic Inclusion or Separation – What´s best in education? The seminar was attended by IAS collaborating partners and students and teachers from Stockholm University and opened up with a short overview of the historical development of Inclusive Education (IE). This was followed by discussion on the definition of Inclusive Education. – IE is about including all children with specific focus on those who are facing barriers to learning and participation and hence vulnerable to marginalization, exclusion and underachievement. This includes children with disabilities, said Stephen Mwaura, IAS Inclusive Education Focal Point. Stephen Mwaura stressed that all children can learn and should be given equal opportunity to reach full potential in education. – IE is about changing the systems to fit and accommodate children facing barriers to learn and participate and not changing the children to fit into the systems. So, how do we remove or minimize these barriers so that all children can have access to quality education? Paul Mbatia, Coordinator from Light from the World also stressed that Inclusive Education looks into transforming education systems in order to remove barriers that prevent children from fully participating in education. And this goes back to how we view people. – What´s your first impression when you see a person who can´t walk? Do you see the impairment or do you see the person behind it? Impairment is not the issue but the issue is how we respond, Paul said. -Education is a basic human right and should be achieved on the basis of equality of opportunity to all children including those with disabilities, Stephen said. Children with disabilities are particularly vulnerable to marginalization and exclusion as they are often not accepted by friends, family or the communities in which they live. It is not uncommon that these children are being hidden in the homes since the parents believe the disability is a curse. Therefore they are also denied the opportunity to go to school. -There is a lot of awareness-work to be done when it comes to changing of attitudes and reducing other barriers in the countries where IAS is implementing Inclusive Education. These countries includes Somalia, Ethiopia, Tanzania, Sudan, South Sudan and Kenya. When children with disabilities are educated in special schools (segregated settings) they are often discriminated and the system tend to force these children to lead a separate life and often unable to fit in the society. Awareness-work in IAS is done by training teachers, capacity building education administrators, awareness creation campaigns, empowering parents and local leaders, putting together parents groups and family networks, collaboration with key stakeholders, early identification and intervention of children, etc. How far should we embrace IE? The seminar ended with a panel discussion on the best way forward, should the education system be inclusion or separation? And how far should we embrace inclusive education? -In IAS we want to give the child the best start in education and a smooth transfer to inclusion in the regular school. Often these children start school very late, since they have been hidden at home, said Stephen. Therefore a child might start in a special class situated in a regular school for about two years or so to get extra support before being included in the respective regular class. While in the special class the children have an opportunity to meet and interact with children with no disabilities which is an integration to the regular class. -Inclusive education is a process, a never-ending search to find better ways of responding to diversity. It is thus an on-going process of changing the education systems (polices, practices, attitudes, resources and environment) so that it can welcome, support and benefit all children, Stephen said. 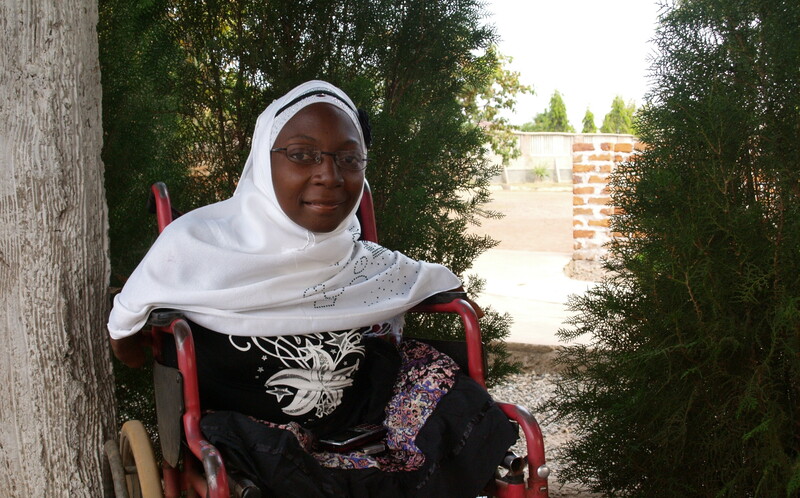 22 year old Kashinde from Tanzania is part of our program Inclusive Education. She is missing both legs and her arms only goes to her elbows. Despite her handicap she is determined to get an education and become a journalist. – I want to be able to support myself, she says. Supportive family members surround Kashinde and her uncle has, on a daily basis and by using his back as the means of transport, carried her to school. 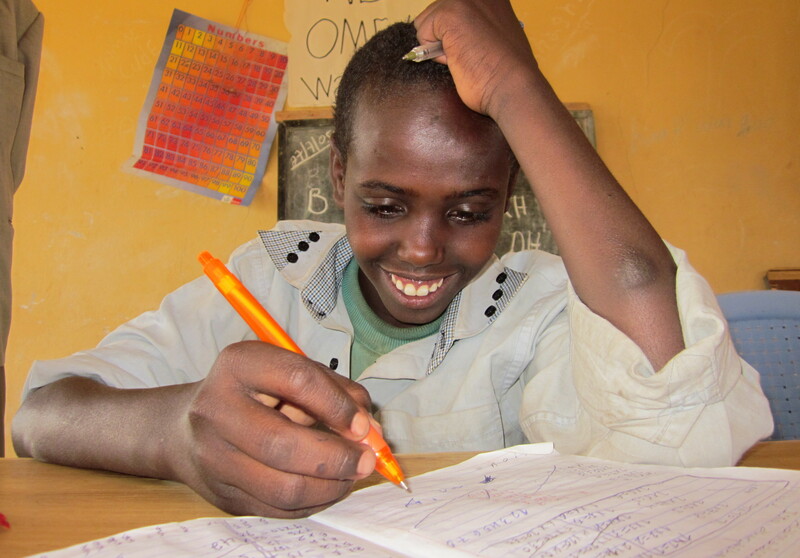 Now Kashinde has completed the eleventh class in the school she attends. She insists that her plan is not to get married. – I want to finish my education, learn English and then work as a journalist at one of Tanzania’s international newspapers. Over the years IAS’ work has helped over 6 million people. With our holistic approach we have transformed lives through our three thematic areas; Integrated Water Resource Management, Civil Society Development and Inclusive Education. IAS ́s work with Inclusive Education is about ensuring children’s right to education on equal terms, regardless of the social or cultural aspects that may prevent them from it. It may be factors such as gender, ethnicity or poverty; that hinder children from being included in the teaching. Say hi to Elisabeth, our new intern! Elisabeth, you are currently doing your master at Stockholm University and will be staying with IAS Head Office during 4 months to work with our program Inclusive Education. Please tell us a bit about yourself. – I’m 24 years old and I have lived in Sweden for almost two years, I’m originally from Munich, Germany. I have a Bachelor Degree from Germany where I studied European Business and Language Studies and I´m currently doing my Master at Stockholm University in International and Comparative Education. I wanted to gain experience in something that relates to my studies; therefore I chose to come to IAS. What will you be doing at IAS? – I will mainly provide support to IAS Program Department on Inclusive Education matters but I will also help wherever I’m needed. One of my courses at university was ‘Educational Planning’, which really relates to the work IAS does in the field of Inclusive and Special needs education. As an “outsider” I hope I will be able to look at IAS work from a different perspective and provide valuable information. Are you also interested in doing an internship or to work voluntarily with us? Send us an email at info@ias-intl.org and we will tell you more! Overview of the IAS Accountability Framework 2012 (58 Kb).